The four Irish siblings have been accused of attempted murder, possessing firearms and belonging to a militant group. THE FOUR IRISH siblings arrested in Egypt will face a prosecutor in Cairo today. The junior Foreign Minister Joe Costello confirmed this morning that the Halawa siblings’ “fate will be decided today”. The three Halawa sisters, Omaima (21), Fatima (23) and Soumaya (27), and their 17-year-old brother Ibrahim have been held in the Egyptian capital’s Tora prison since being taken from the al-Fatah mosque on 17 August. 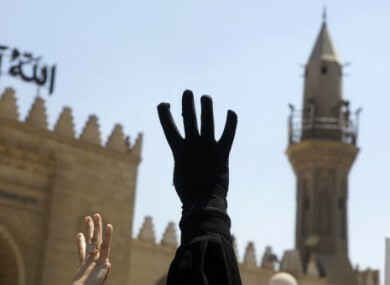 The four were taking part in a demonstration calling for the reinstatement of ousted Egyptian president Mohamed Morsi. They are accused of attempted murder, possessing firearms and belonging to a militant group. The Department of Foreign Affairs is assisting the siblings. Email “Halawa siblings to face Egyptian prosecutor today”. Feedback on “Halawa siblings to face Egyptian prosecutor today”.